Royal Natal National Park in the Drakensberg, South Africa, offers you a range of outdoor activities during a KwaZulu-Natal holiday, from walking and riding to fishing, climbing and hiking. At Royal Natal National Park in South Africa, visitors will discover exciting walking and Drakensberg hiking adventures, horse riding trails as well as opportunities for trout fishing, swimming, climbing and relaxing with a picnic on a KwaZulu-Natal holiday. Visitiors to this KwaZulu-Natal nature reserve in South Africa can also visit the Tugela Falls. For those who just want to relish the clear mountain air and magnificent views, there are many scenic spots and places to swim in the clear mountain streams. Trout fishing at Royal Natal National Park is available in a dam and in the Mahai and Thukela (Tugela) rivers. 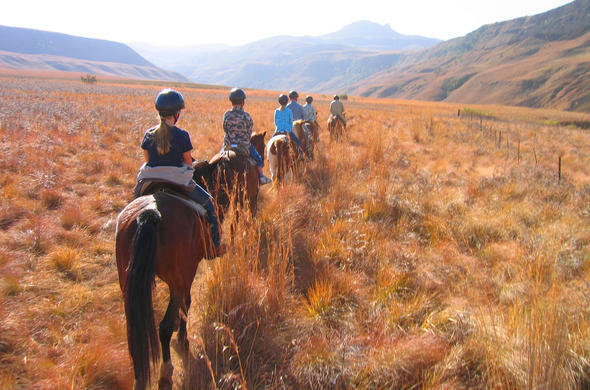 The stables at Rugged Glen provide opportunities to ride into the mountains for unique landscape views and sightings of Mountain Reedbuck and Grey Rhebuck that seem to have no fear of people on horse back. On a KwaZulu-Natal holiday at Royal Natal National Park, guests can see the Bearded Vulture (Lammergeyer) and Black Eagle riding thermals that rise above the Mont-aux-Sources plateau. Mont-aux-Sources, which means 'mountain of sources', is so named because several rivers begin their journeys here. The surrounding valleys and ridges offer wonderful walks through an ever changing landscape with many upland birds and flowers. The most popular activity at Royal Natal National Park is undoubtedly hiking. A comprehensive hiking guide is available for purchase at the Thendele Camp Visitor Centre, and at the main entrance gate. The brochure has a map and shows the extensive network of hiking paths from the gentle walk to Fairy Glen to the challenging hike up the Crack and down the Mudslide. The so-called Otto's walk is well suited for beginners or there is a trail that goes to the Tugela Gorge, traversing the indigenous forests and grasslands adorned with Proteas and dazzling stands of Yellowwoods. For the last part of this hike there is a climb up a little chain ladder to a spectacular view of the Tugela Falls. For the more experienced there is the 45km (27 mile) Mont-aux-Sources trail which takes two days to complete. Travelling by car, it is possible to visit the summit of Mont-aux-Sources in a day by driving around to the Sentinel car park at the end of the road and purchasing a permit en-route. This day trip is an extremely popular expedition but visitors are advised to take protective clothing as the high altitude weather is extremely unpredictable and can change very quickly. Explore ancient San bushmen paintings in Royal Natal National Park in South Africa. This Drakensberg area is an unspoilt world of pure natural beauty characterised by the Amphitheatre, Mont-aux-Sources and the Tugela Falls. Mont-aux-Sources forms the background of the skyscraping Drakensberg Amphitheatre - a solid rock wall that rises up to about five kilometres. Explore this peak on the Mont-aux-Sources trail.